The early weeks of 2018 were dominated (at least in aviation circles) by talk about the questionable future of one of the industry’s most heralded – and still relatively young – aircraft, the Airbus A380, colloquially known as the superjumbo. After several years of dwindling orders for the behemoth of the skies and plenty of speculation about its future, Airbus finally admitted that it may have to shut down production unless it received a major new order for the superjumbos. Lo and behold, a few days later, Emirates ordered 36 new A380s and the production line’s future has been secured. The A380, which was first launched as a commercial passenger jet by Singapore Airlines in 2007, has long been leading the way for innovation within the premium cabins, with all that extra room allowing airlines to get creative. Back in 2014, Etihad Airways garnered a lot of publicity when it launched The Residence – the first multi-room suite on a commercial passenger aircraft – featuring a separate lounge, bedroom and shower room. Other airlines have been slowly trying to catch up with such developments – Singapore Airlines launched new first class suites with fully-flat double beds towards the end of 2017 on its A380s. While the superjumbo has always been a headline grabber, it’s the emergence of two other long-haul aircraft – the A350 and Boeing’s Dreamliner – that will have more significance over the next few years as airlines put more of them into service. Both aircraft offer compelling economic benefits to airlines. The two aircraft types are seen as being direct competitors in the long-haul market with similar passenger capacities and flying ranges, in fact, British Airways and Virgin Atlantic are due to start flying them from 2019 onwards. BA currently has 18 Airbus A350-1000s on order as well as 12 Boeing 787-10s, while Virgin Atlantic has ordered 12 A350-1000s, which will have three cabins: economy, premium economy and Upper Class. Receiving these new aircraft in 2019 will coincide with the launch of BA’s long-awaited new Club World business class seat, which is currently “in development” and will be rolled out from next year. BA’s chief executive officer Alex Cruz has already confirmed that the new Club World seat will offer “direct aisle access” – BA’s current Club World configuration has long been criticized for failing to offer this facility from many seats in the cabin. Cruz has insisted that BA is still a “premium airline” and that the “glory days” are coming back as the airline prepares to celebrate its 100th anniversary in 2019. He has also promised to improve the Club Europe business class service on short-haul routes with BA set to enhance the catering offered in this cabin this year, following on from last year’s upgrade to Club World’s catering on long-haul flights. Virgin, meanwhile, has yet to reveal its plans for the premium cabins to be fitted on its A350s from next year. So while we wait to see exactly what BA and Virgin will do with their premium cabins on these new aircraft, what about carriers that are already operating A350s? Cathay Pacific has had A350-900s in service for almost two years and the Hong Kong-based airline has used their introduction to launch a new business class seat. Meanwhile, Delta has become the first US carrier to start operating the A350, with flights to Tokyo, and is due to launch the aircraft’s first transatlantic route between Detroit and Amsterdam from 31 March. Delta’s A350 sees the long-awaited introduction of the Delta One business class suite, complete with its own sliding door. The airline also plans to retrofit the Delta One suite on to its entire fleet of Boeing 777s. 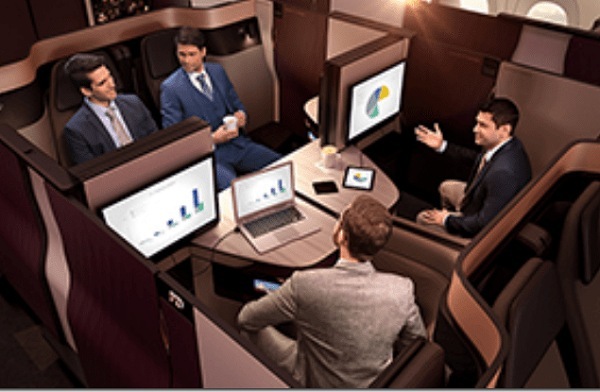 Looking more widely, new enhanced premium cabins are already catching the eye of those in the corporate travel industry, with several name-checking Qatar Airways’ new Q Suite, initially launched last year on its Boeing 777s, as raising the benchmark for business travelers. The Q Suite has introduced tables of four, making it easy for groups of colleagues to convene and hold meetings when travelling. This is going to be a big change in terms of increasing productivity during travel. While there is going to be an understandable focus over the next couple of years on new aircraft and the premium cabins being installed on them, a more immediate concern to travel buyers is how much it is going to cost to travel at the front of aircraft this year. Several TMCs have produced forecasts on the likely direction of premium airfares during 2018. The The consensus is there will only be “marginal gains” in ticket prices, with the growing strength of the global economy being mostly offset by an increase in capacity to meet this higher demand. However, long-haul business fares are expected to rise more strongly in certain key markets such as France (+2 per cent), Germany (+2.75 per cent) and the US (+4.9 per cent) as their economies are set for faster GDP (gross domestic product) growth than other markets.